Utama > Renal > Screening - Renal > What Is Proteinuria And How Does It Occur? One of the earliest signs of kidney disease is the detection of protein in the urine, hence named proteinuria. 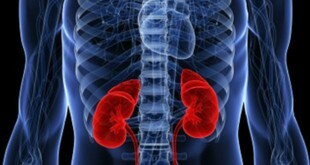 The kidneys make urine by filtering blood. Protein from the food that you eat is broken down in the stomach and absorbed into the blood stream. 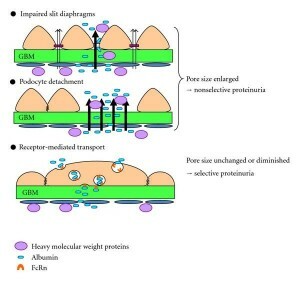 Usually, no protein leaks into the urine as it is too big to pass through the tiny holes (pores) of the kidney filters. 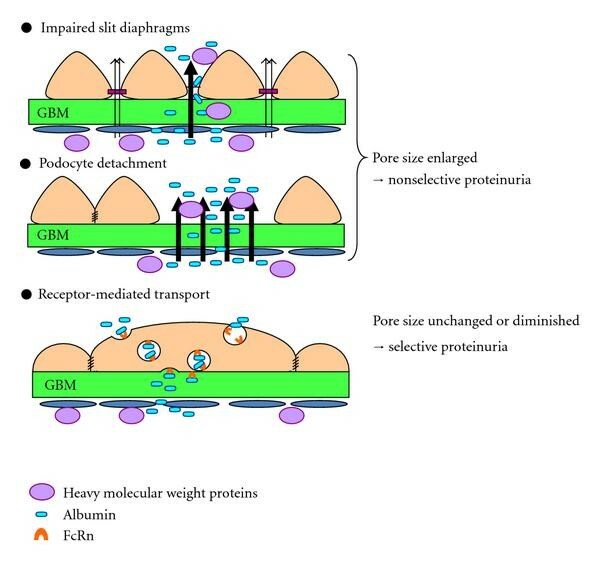 When there is damage to these tiny kidney filters called the glomeruli, protein escapes into the urine. 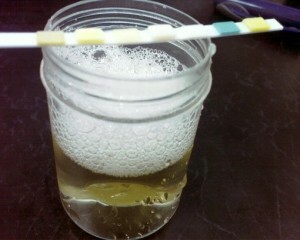 Proteinuria is usually detected by using a simple urine dipstick test. 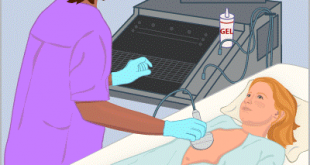 This test is sensitive, convenient, cheap and widely available. This test requires a sample of urine preferably an early morning specimen and a small plastic strip with an indicator attached to it. 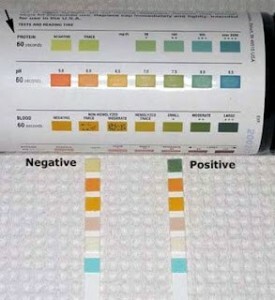 A change in the colour on the strip will signify you have protein in the urine. The intensity of the colour change on the strip can estimate the quantity of protein in the urine. Urine dipstick does not provide an accurate measurement of the degree of protein loss. 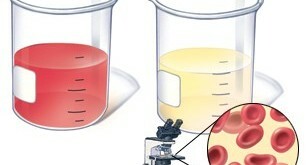 Therefore, to get an exact measurement, a urine specimen needs to be sent to the laboratory. This can be done with a single early morning sample, in which the laboratory measures the levels of protein and creatinine known as protein-creatinine ratio (PCR). This method has largely replaced the 24-hour urine collection as it has been found to be more convenient. A PCR value of < 15 mg/mmol is normal. This is equivalent to about 0.15gm/24 hours (PCR 100). A PCR of <50 mg/mmol usually does not indicate serious kidney disease provided that the kidney function is normal. 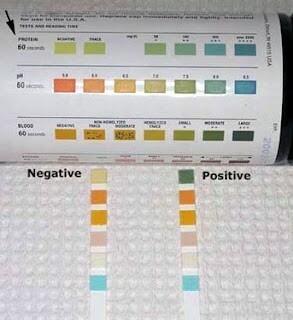 Another method use to quantitate proteinuria is to do a whole day (24-hour) urine output collection. This is cumbersome and tedious as it requires collecting of all urine that has been passed into a container from the start of the test in the morning to the next morning. This container then needs to be sent immediately to the laboratory for analysis. 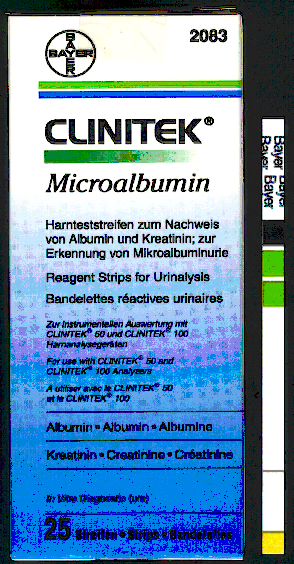 It is also possible to measure the amount of protein in the urine by testing for the albumin-creatinine ratio (ACR). Albumin is the main protein in the blood stream, and anyone with a raised PCR will have a raised ACR, though the level will be slightly lower. ACR is used more often in screening for proteinuria in people with increased risk of kidney disease for example patients with diabetes, hypertension or patients with family history of diabetes and hypertension. Normal ACR: <3 mg/mmol. This is ? 30 mg/24 hours (normoalbuminuria). When small quantities of albumin are present 30-300mg/24 hours), this is termed microalbuminuria. It cannot be detected using a routine dipstick test. When is the ACR ? 300mg/24 hours this is called macroalbuminuria. A small amount of protein in the urine does not cause any symptoms. However, severe protein losses in the urine can cause frothy urine, swelling of the ankles, swelling around the eyes, swelling of the limbs, swelling of the abdomen and breathlessness. 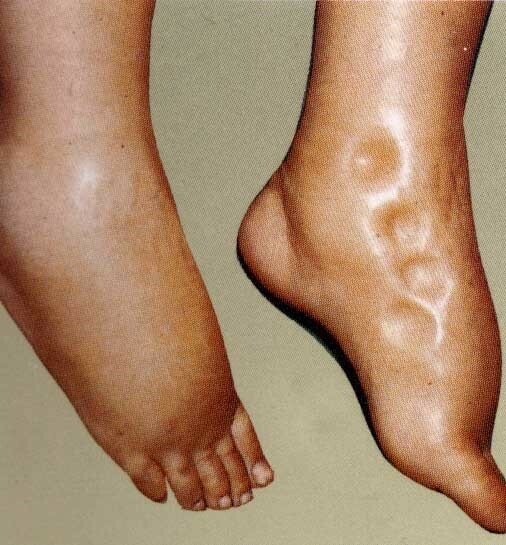 This swelling is due to accumulation of water in the body.